Metered street parking is available on the surrounding streets, and there are some free spaces on the south side of Iowa. There is a public parking lot next door to our offices on Idaho between Sawtelle and Corinth. Please check signs regarding time limits and street cleaning. OUR HOUSE is located on the north-west corner of Sawtelle and Iowa. The building entrance faces Sawtelle. To enter the building, please use the call-box to dial OUR HOUSE. The number will be clearly displayed on this kiosk. 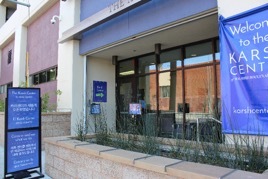 Should you need to use the handicap ramp, please let us know when you call and we will open the door. The handicap ramp is ten feet north of the main entrance. Free street parking is available on Burbank Blvd. OUR HOUSE is located within Warner Gateway, between Topanga Canyon Boulevard and Canoga Avenue on the south side of the street. You can look for the Warner Gateway “For Lease” sign – driving east, this sign will be on your right; driving west, it will be on your left as you approach our address. There is also free street parking on Owensmouth both north and south of Burbank Boulevard. To park in our parking structure: Continue on Burbank to Owensmouth. Head south on Owensmouth and look for the Warner Gateway Visitor Parking structure at the end of the cul-de-sac on Owensmouth. Parking fees are $1.50 per ½ hour. Enter our Warner Gateway business park by walking in next to the Warner Gateway Visitor Parking structure at the end of the cul-de-sac on Owensmouth. 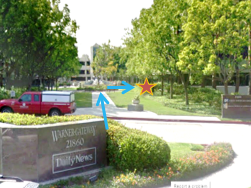 We are to the left of the fountain when facing Burbank Blvd. Walking from Burbank Boulevard: f you are walking from Burbank Boulevard, you will notice the water fountain just beyond a roundabout. Walk towards the fountain and the entrance to the building is to the right of fountain. OUR HOUSE is just off of the lobby down a small corridor on the right. There is free and secure parking in the lot on Hobart and West 6th Street. You will be asked to show your ID and mention that you are attending an OUR HOUSE group. Once parked, follow the signs for the exterior Karsh Center street entrance on 6th Street. The front door is on 6th street.